We'll also have young adult Novelist and Book-Buyer Catherine Linka (to tell us what every writer needs to know about retail book buying today) and middle grade Novelist and social media guru Greg Pincus on faculty. There will be also two agents and an editor on faculty - all interested in finding new-to-them writers. Danielle Smith, Associate Agent at Foreword Literary Agents and Heidi Fiedler, Editor at both Teacher Created Materials (work-for-hire) and at Argosy Press (trade publishing) will present keynotes on Saturday. Jennifer Rofé, Agent at Andrea Brown Literary Agency, will round out our faculty on Sunday. 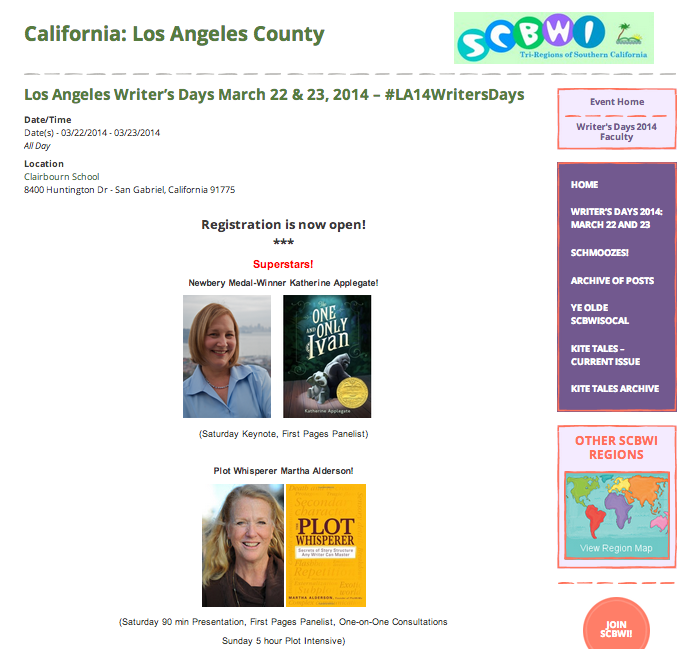 If you write for kids or teens, I look forward to seeing you there!